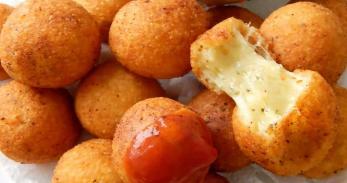 Bunuelos De Queso (Cheese Fritters) - Tienditadepuertorico.com - Buy Puertorican Food Here!! Beat eggs, garlic, milk and sugar together in large bowl. Sift flour, oregano, paprika, ceyenne pepper, baking powder and salt into second bowl. Fold in cheese and ham. Heat oil for deep frying to 350-365° Fahrenheit (if you have a thermometer) . Drop spoonfuls of batter into hot oil and fry until golden brown. Remove to a plate lined with paper towels and repeat with rest of batter.